Historically, natural products have been pharma’s treasure trove. According to the Natural Products Library Initiative at the Scripps Research Institute, “from 1940s to date, 131 (74.8%) out of 175 small molecule anticancer drugs are natural product-based/inspired, with 85 (48.6%) being either natural products or derived therefrom. From 1981 to date, 79 (80%) out of 99 small molecule anticancer drugs are natural product-based/inspired, with 53 (53%) being either natural products or derived therefrom.”In a sense, this is not surprising. In nature, after all, creatures – and at the more basic level, structures, such as receptors and their ligands – have been co-evolving for billions of years. Limited accessibility from natural sources and/ordifficult synthetic accessibility etc. Nevertheless, natural products as well as their derivatives continue to play a significant role in the discovery of new approved therapies, as they have done since the earliest days ofmedicinal research.Thus, Butler highlights that 21 natural-product-derived drugs were approved for use in Western markets during the period 1998-2004 . A more recent update to this indicates an additional 19 natural-product-derived approvals during the period January 2005 to April 2010 . Natural products have proven successful modulators of difficult targets such as a range of antibacterial targets and, especially, protein–protein interactions . Furthermore, many researchers consider natural products and their derivatives as a privileged tools for the study and manipulation of protein function . In general, renaissance of the pharma industry interest toward natural products research is observed nowadays since they provide a unique biologically relevant chemical space, especially for difficult, traditionally intractable but nevertheless high value targets. Many methodologies and approaches have been developed to eliminate the above-mentioned obstacles to research and, accordingly, to a wider application of natural substances in drug discovery. Synthesis of natural-product-derived compounds is one of them. In this case, libraries are generated around a scaffold that is identical to that of the leading natural product and which is obtained by means of chemical modification or degradation. The library members are then synthesized (preferably in combinatorial synthesis mode) from the scaffoldusing a step-by-step derivatization. 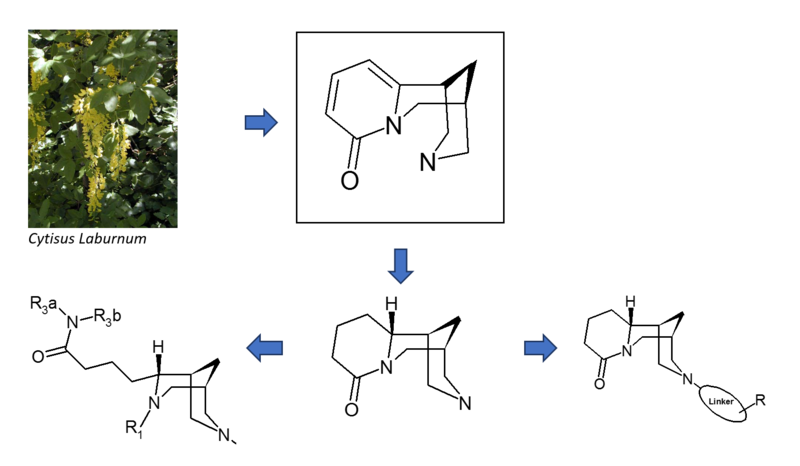 The substitution pattern, stereochemistry, and structure of the scaffold may be set as in the natural product itself [4, 5]. This promising approach has been already applied at ChemDiv to synthesize small cytisine-based library . Furthermore, it has been successfully used to build up more than 4000 members library based on some readily available natural products. The library is a special sub-set ofChemDiv anti-infective and PPI-modulators library. 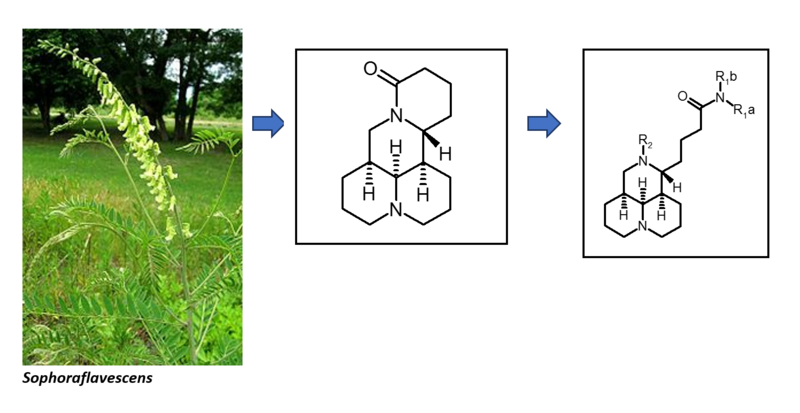 (−)-Cytisine is an alkaloid extracted from various plants belonging to the Leguminosae (Fabaceae) family and particularly from the seeds of the common garden decorative tree Laburnum anagyroides (Cytisus Laburnum, Golden rain acacia). Its uses in traditional medicine started thousands of years ago: Indians in America consumed Laburnum seeds for their emetic and purgative effects. In Europe, it was used as a respiratory analeptic, a diuretic, or an insecticide. Moreover, during the WW II, the leaves of Laburnum anagyroides were used as tobacco substitute. (−)-Cytisine has been marketed in Central and Eastern Europe (trade name: Tabex) and used for over 40 years to treat tobacco dependence despite the lack of clinical studies. In 1990s, it was demonstrated that (−)-cytisine has a high affinity at nicotinicacetylcholine receptors (nAChRs)10−14 with high α4β2 subtype selectivity . Since that, the chemistry and pharmacology of cytisine and its derivatives have been in focus of many research groups. 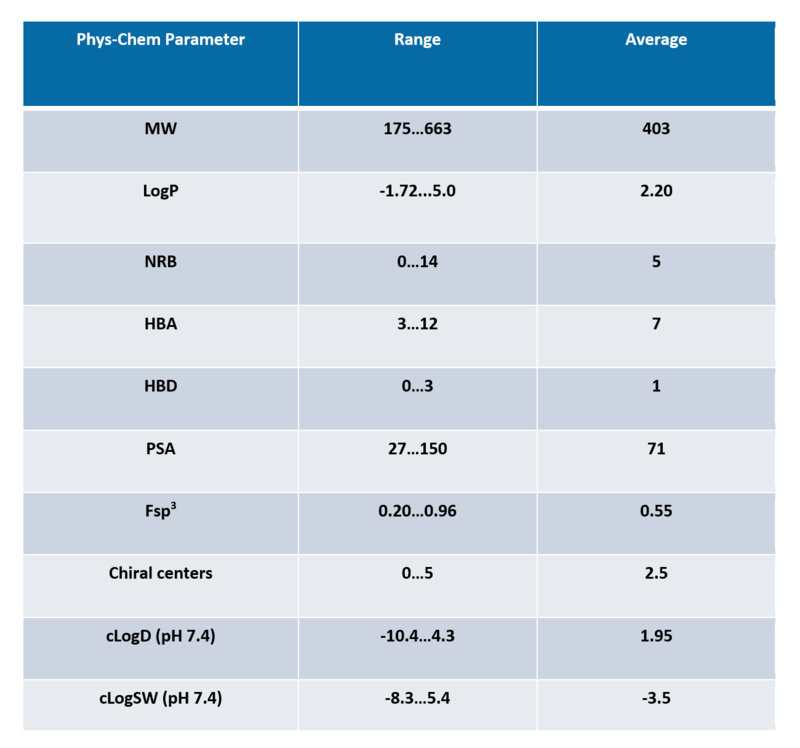 While N-C(Ar)-derivatives of cytisineare widely represented in the literature and at the market of screening compounds, tetrahydro-cytisine-based derivatives are underrepresented. In turn, tetrahydro-cytisine is readily available by stereoselective catalytic reduction of pyridone ring. This was used for production of several unique scaffolds and the library around them. 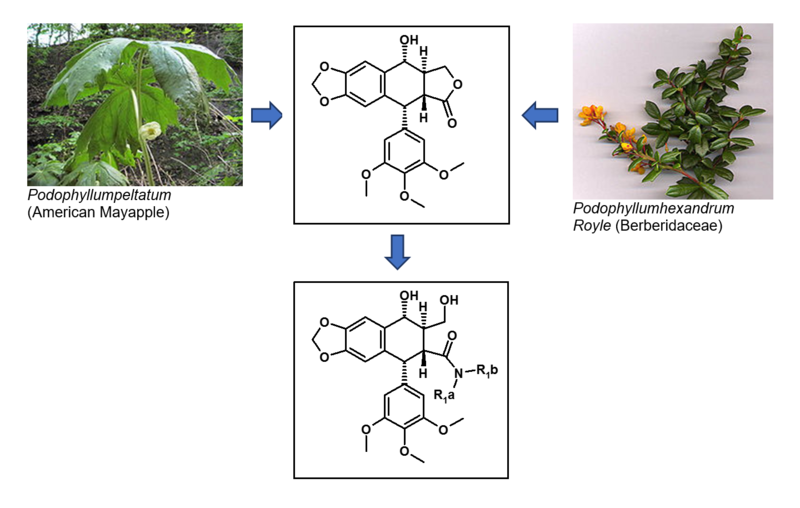 Podophyllotoxin (PPT), also known as podofilox, is a non-alkaloid toxin lignin extracted from the roots and rhizomes of Podophyllum species such as Podophyllumpeltatum (American Mayapple) and PodophyllumhexandrumRoyle (Berberidaceae). Under the trade names Condylox (a gel), and Wartec (a solution or cream), it is used on the skin as a topical treatment of external genital warts, caused by some types of the human papillomavirus (HPV), and other warts. PPT and its derivatives display a wide selection in medical applications such as purgative, vesicant, antirheumatic, antiviral, and antitumor agents, e.g. etoposide, teniposide, and etopophos. Their anticancer activity has been heavily under study and used in various chemotherapies, including lung cancer, lymphomas, and genital tumors. 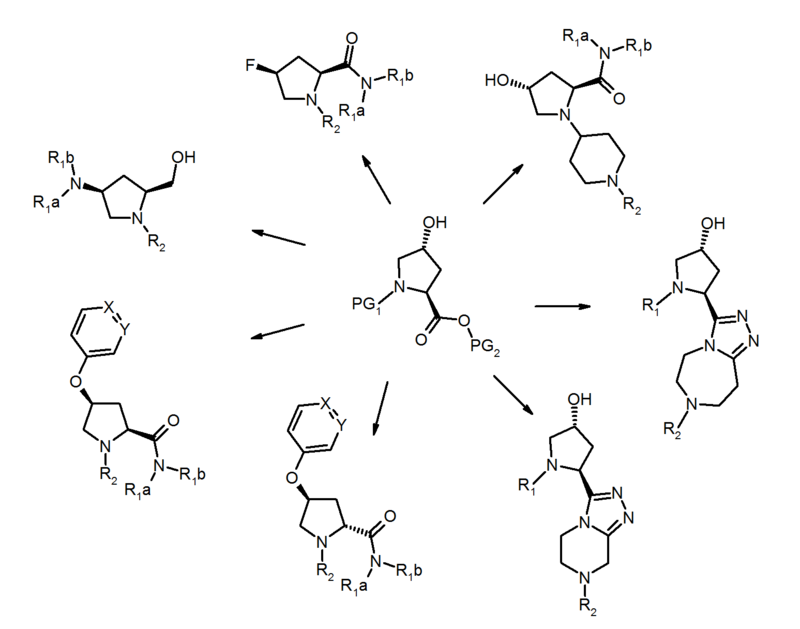 ChemDiv’sPodophyllotoxin-based library consists of approx. 80 members. Lactone cleavage with diverse set of aliphatic, (hetero)aromatic, and heterocyclic amines was used for their synthesis. Matrine is an alkaloid found in plants from the Sophoragenus. It has a variety of pharmacological effects, including anti-cancer effects, and action as a kappa opioid receptor and µ-receptor agonist. Matrine possesses strong antitumor activities in vitro and in vivo. Inhibition of cell proliferation and induction of apoptosis are the likely mechanisms responsible for matrine’s antitumor activities. Matrine is a component of the traditional Chinese medical herb SophoraflavescensAit. ChemDiv’s Matrine-based library consists of approx. 650 members. Lactam cleavage followed by modification of amine or carboxylic functionalities employing suitable protective strategies was used for the library members synthesis. Commercially available trans-4-hydroxyproline has been employed as a convenient multifunctional building block for unique scaffolds synthesis. Only stereo-controlled reactions have been used to ensure defined configuration for all chiral centers in final library members and therefore their diastereo- and enantio-purity. Butler, M.S. Natural products to drugs: natural product derived compounds in clinical trials. Nat. Prod. Rep.22, 162–195 (2005). Barker, A., Kettle, J. G., Nowak T., Pease J. E. Expanding medicinal chemistry space.Drug Discov. Today18, 298-304 (2013). Rizzo, S., Waldmann, H.Development of a Natural-Product-Derived Chemical Toolbox for Modulation of Protein Function. Chem. Rev.114, 4621−4639 (2014). Combinatorial Synthesis of Natural Product-Based Libraries. Ed. Boldi A. M. CRC Press, 368 pp (2006). Ivachtchenko, A.V., Tkachenko, S.E., Sandulenko, Y.B., Vvedensky, V.Y., Khvat, A.V. A Parallel Solution-Phase Synthesis of Substituted 3,7-Diazabicyclo[3.3.1]nonanes. J. Comb. Chem. 6, pp 828–834 (2004). X. Morelli, R. Bourgeas and P. Roche, Curr. Opin. Chem. Biol., 2011, 15, 475–481. Rouden,J., Lasne, M.-C., Blanchet, J., Baudoux, J. (−)-Cytisine and Derivatives: Synthesis, Reactivity, and Applications.Chem. Rev.114, 712−778 (2014).